Two Miyazaki’s in a row! Spirited Away is the breakthrough Studio Ghibli film, the one that brought the animation house mainstream international success. The story is a classic fairy tale of the ‘lost girl’, reminiscent of so many texts from Peter Pan and Alice in Wonderland through to the films of my childhood like Labyrinth and Return to Oz. That’s a major part of why I liked the film so much, it seemed to me to be a continuation of a classical theme in much the same way that the Harry Potter series has updated the ‘boy wizard’ story for a modern audience. The journey of our lost girl (Chihiro or Sen depending on the point in the story) takes her to a mythical bath house where ancient spirits come for respite. Chihiro winds up becoming an integral part of the community before going on to unravel the mysteries and conflicts that threaten to endanger everyone. The film is filled with joyously inventive scenes animated with verve and character, in particular the train journey was a beautiful and tranquil sequence. There isn’t much action in the same sense as Princess Mononoke, no major limb-loss here – but unlike that film Spirited Away doesn’t really suffer any pacing issues around the central act. I’ll be reviewing three Studio Ghibli films over the next week or two because I’ve decided to help somebody out with their Film Studies coursework on the films of Miyazaki. So to that end, Matt – here’s what I thought to be the main important issues of the film (also check the comments on the little sticky post-it up there). 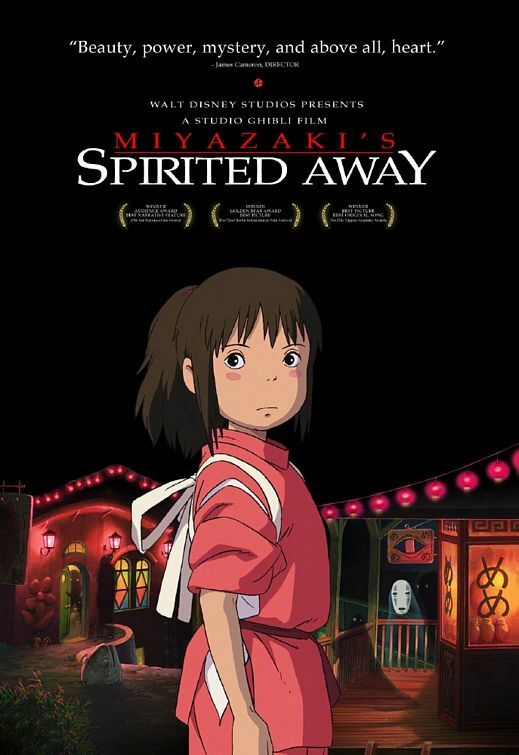 Spirited Away was a massive international success and I think it could be worthwhile exploring to what extent Miyazaki and Studio Ghibli have made this happen. Has their choice of a classical plot device influenced this success? I certainly think it may have helped. The film also has an abundance of strong female characters. Aside from Chihiro there is the bath house owner and her sister Yubaba and Zeniba, two powerful witches who seem to be the dominant force in their spirit realm. Parallel this female ownership with that of Lady Eboshi in Princess Mononoke, what is Miyazaki trying to say with this?